KeraPRO Restorative Shampoo for Dry to Very Dry Hair is a deeply restorative daily shampoo that provides extra nourishment for dry to very dry hair. Contains scientifically-advanced glucose, lipid and keratin protein actives. 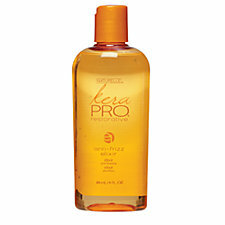 Strengthens and replenishes thirsty strands leaving hair soft, shiny and healthy. Apply to wet hair and massage into scalp. Rinse thoroughly. Water/Aqua/Eau, Sodium Laureth Sulfate, Cocamidopropyl Betaine, Sodium Chloride, Hydrolyzed Keratin, Hydrolyzed Rice Protein, Glucose, Carthamus Tinctorius (Safflower) Seed Oil, Amodimethicone, Glycol Distearate, Acetamide MEA, Acrylates Copolymer, Sorbitol, Cocamide MEA, Guar Hydroxypropyltrimonium Chloride, Polyquaternium-7, Citric Acid, Acrylates/PEG-10 Maleate/Styrene Copolymer, Laureth-10, PEG-150 Pentaerythrityl Tetrastearate, C11-15 Pareth-7, Laureth-9, Glycerin, PEG-6 Caprylic/Capric Glycerides, Trideceth-12, PPG-12-Buteth-16, Tetrasodium EDTA, Methylchloroisothiazolinone, Methylisothiazolinone, DMDM Hydantoin, Limonene, Fragrance/Parfum, Yellow 5 (CI 19140), Yellow 6 (CI 15985). I bought this shampoo on sale at Sally’s for half price. This shampoo cleaned my hair really well without stripping it. My hair felt strong and nourished yet soft. It smells like a cheap soap, nothing fancy, it is a bit runny so if you’re like me, be careful that you don’t waste it in the bath lol. This shampoo does what it claims which I love so I’m happy. I like this shampoo and will keep purchasing it, I would certainly recommend it. KeraPRO Restorative Anti-Frizz Elixir is a lightweight styling and leave-in conditioning elixir that seals in nourishment for all-day softness and shine. 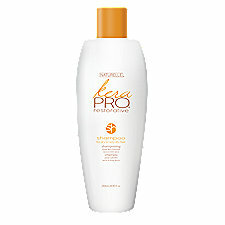 Creates maximum smoothness, volume control and long-lasting frizz protection for beautiful, everyday style. Contains scientifically-advanced glucose, lipid and keratin protein actives. Begin with a dime-sized amount and apply to towel-dried hair, focusing on mid-lengths and ends. Apply more as needed. Style as usual. I also purchased this for half price at Sally’s. I love that this serum is very light; it reminds me of a light oil, it’s not greasy or sticky at all. It is very runny, so again be careful. I use this only when air-drying because I don’t trust that it will provide much protection against heat. This serum leaves my hair soft and smooth; it does not weigh my hair down and is perfect for people with fine hair because it’s so light. To me, this also smells like a cheap soap but the scent doesn’t linger. One of the ways I judge a serum is by how it washes off my hands; it gives me an idea of how harsh my shampoo will need to be to remove it from my hair. Would I recommend it? Yes, it is light which makes it great for air-drying and sealing.